What’s inside Karan Johar’s ‘Koffee Hamper’, did it fail to impress? 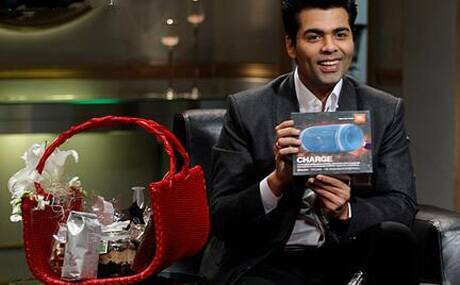 Karan Johar almost in the last (ditch) attempt to up the show's score revealed the contents of the 'Koffee Hamper'. 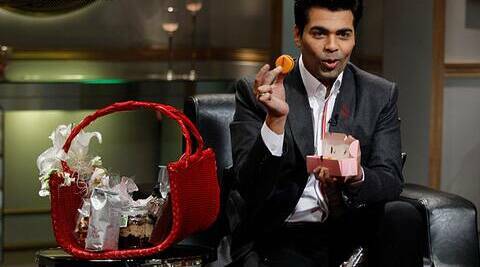 Karan Johar almost in the last (ditch) attempt to up the show’s score revealed the contents of the ‘Koffee Hamper’. Much like the fourth season of Karan Johar’s ‘Koffee With Karan’, the coveted ‘Koffee Hamper’ was a let down. The filmmaker, who hosts the controversial celebrity chat show, almost in the last (ditch) attempt to up the show score, did what he had never done before, revealing the contents of the prized and most talked about ‘Koffee Hamper’. The ‘Koffe Hamper’, which has been in Karan Johar’s own words is amongst the ‘higgest honours’ of the film fraternity, has seen celebs fight over it, and even sulk after not winning one. While one may have expected the beautifully packaged, heavy red basket of goodies to shower some extravagant stuff on the table, it only included an assortment of high end boutique chocolates, honey among other edibles. Among the gifts in the hamper was ‘Moet champagne’, Forrest Essentials’ (sponsor) 24 karat gold radiance cream, Satya Paul tie-set, Chocolate Syringe, ‘Koffee’ mugs, Macarons. The hilarious part was when Karan Johar wondered aloud as to why are Royce Chocolates (part of hamper) so expensive! Besides the edible stuff, the hamper comprises JBL Charge portable speakers. Actresses Parineeti Chopra and Alia Bhatt, brought down the curtains on the fourth season of ‘Koffee With Karan’ on April 5. This season of the chat show was not quite as well received as the others for various reasons. While the ‘Koffee debutantes’ Salman Khan, Aamir Khan and Akshay Kumar remained its high points. The absence of Shah Rukh Khan was also missed on the show. ‘Koffee’ veterans such as Kajol, Deepika Padukone, Priyanka Chopra, Sonam Kapoor, Anushka Sharma were too conscious to give their best. What's inside Karan Johar's 'Koffee Hamper', did it fail to impress?